Question: When’s the last time you sat for a spell on your front porch? If you’re lucky enough to have a front porch on your house, we’re betting it may not get as much use as your other outdoor areas. In the land of hospitality, we Southerners all know the importance of making your front porch inviting to guests, but guess what—it ought to be inviting to you as well. As the first glimpse into your home, your porch should be an extension of your interior decor while also amping up your house’s curb appeal for passersby and approaching guests alike. 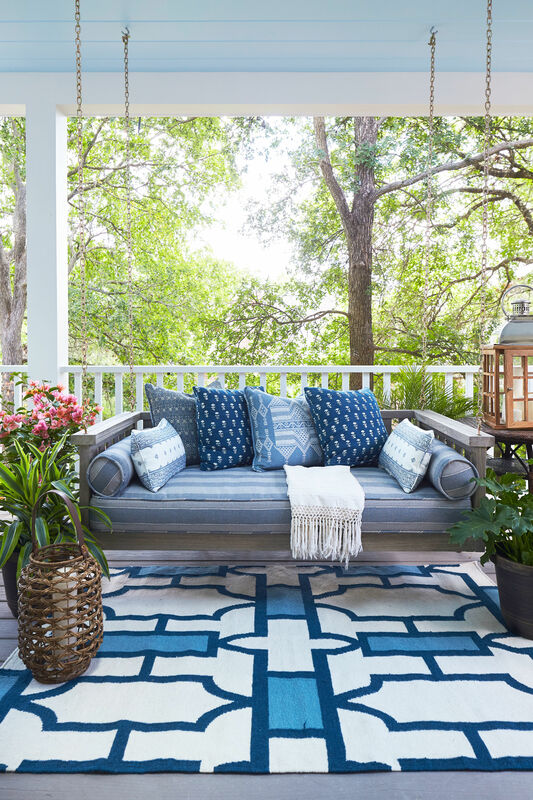 To help make your front porch an inviting, beautiful space even you want to spend time on, we’re sharing the styling secrets behind some seriously impressive front porches. It’s just a fact: A home where you can see signs of life is a home that looks welcoming to visitors. Even if your shades are drawn and there aren’t many lights on, a well-appointed front porch will help make your house look like a welcoming gathering space. 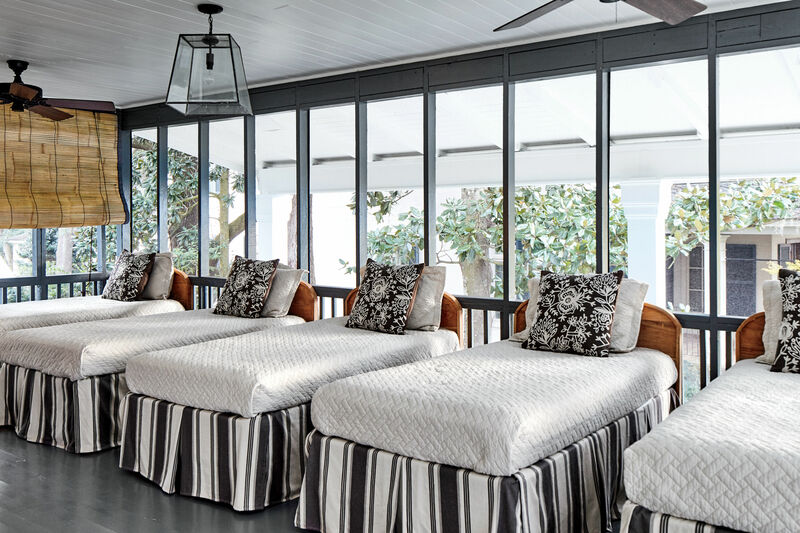 If you only have room on your porch for a couple rocking chairs or a bench, that’ll do it—add some cushions and a side table to strengthen the effect. If you have more room, though, create a cozy seating area, centered around a rug, that can accommodate a handful of your closest friends. As is true with interior design, a well-layered outdoor space looks lived-in and way more inviting than something that’s stark and bare. Everyone knows the best time for porch sitting is as the sun is setting—and for however long folks want to linger there after—so make sure your outdoor living room has enough light to illuminate everyone’s faces, but steer clear of any too-bright light bulbs that make the space look more sterile than warm. String Christmas or bistro lights along the inside of your porch ceiling (so they aren’t visible from the street to give off a keep-my-Christmas-lights-up-all-year-long vibe) or add additional wall or hanging lanterns that match those near your front door. Bring some large, sturdy table lamps outside to really reinforce the outdoor room feel. And don’t forget old fashioned candle light. Large table-top lanterns make for great porch decor, and can also protect your candles from the elements. Someone might take this as a challenge, but we’re gonna say it anyway: There’s no such thing as too many porch plants. Having plants on your front porch reinforces the signs of life thing we mentioned earlier. Add lots of color—via the plants or pots they’re in—or stick with a monochrome palette of green plants and black planters for a more minimalist look. Think outside the standard flower pot box, also: Add trees for height or place smaller pots on a bench or table to make them more visible. Window boxes can be a great addition if you have smaller front-facing windows (and will be much more convenient to maintain). And of course, hanging ferns or flower pots is a classic Southern porch look that’ll never go out of style. No matter how great of a seating area you set up on either side of your front porch, make sure your front door remains the focal point. That is what most people just passing by will see, after all. To do that, make sure your planters evenly flank the front door (if your door is in a corner, stagger planters out to the open side of the door) to create a sort of funnel towards it. If your porch is on the darker side and there isn’t much contrast between the color of your exterior walls and the door, create some by painting your door or the trim around it a color that will pop even from far away. And of course, don’t forget a fun doormat.